Just a quick little late night post for you guys today, as I was bored, and I have some time to waste! 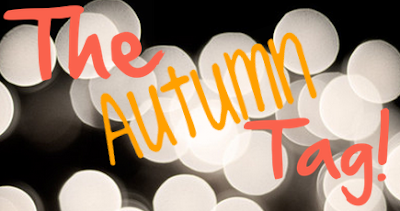 I saw this tag floating about, and because I love Autumn so much (see here), i thought this tag would be super fun to do! I'm going to have to be boring and say hot chocolate (specifically the orange flavour). In my opinion there's nothing better than relaxing in warm, comfy clothes and a hot chocolate. This is hard, because there isn't a specific "Autumn Scent" for me, but i'm loving cinnamon, and also cherry right now, random, but the smell I like changes all the time. A deep berry red is absolutely perfect for Autumn. I especially love the Rimmel Kate Moss lipstick in 107, it's just the most amazing deep red ever, and I think it would suit any skin tone, which is always great. I don't change moisturiser in the autumn (should I? ), so it's still the Simple "kind to skin" hydrating moisturiser. Purple! Well, occasionally. I tend to steer clear of bright colours on my eyes and only use nudes, but I think a subtle hint of purple through the crease or in the outer corners of my eyes adds a little something unusual and Autumnal to my makeup. Recently, i've rekindled my love for "Scouting For Girls". Their songs are mostly feel good songs, and perfect to put you in a good mood. Lawson are also great for Autumnal songs. Autumn is my favourite time of year style-wise. I love wearing baggy jumpers, woolly cardigans, hats, leggings, boots with socks peeking out the top, Autumnal colours, etc.. Pretty typical, but I love to be in my house, all cosy in my bed, or on the sofa, either on my laptop or with my head buried in a book, with a hot drink and some food. Saying that though, I do also love to go shopping with my friends, as I love Autumn weather. So that's it! I have to say that next week my posts may not be frequent as I have work experience (in a design studio, i'm so excited!) all day, and i'll probably just want to sleep when I go home, so just a little heads up on that. I tag all of you to do this tag, if you love Autumn as much as me! P.S - If you have any post ideas, please let me know! I have a few written down in my "blogging notebook", but it's always good to have to many than too little! My Commonwealth Games Interview Update! Acid Wash || Yes or No? Collective Haul || Topshop, Essie and More!